As of November 1st, 2016, we have now relocated our office headquarters from One South Dearborn to 55 East Monroe, Chicago, Illinois. 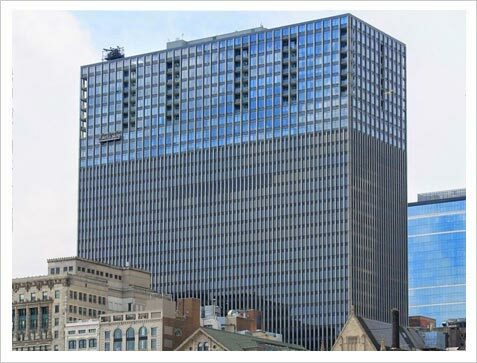 55 East Monroe is the Mid-Continental Plaza building is a prestigious address of new, luxury office space in the heart of Chicago. This location in the affluent shopping district make it an impressive place to address our business matters. Walking distance from major attractions like Magnificent Mile and Millennium Park, this location is popular with visiting clients. The building has an abundance of convenient amenities including a Chase Bank, jewelry store, CVS Pharmacy, café, barbershop, dry cleaners and alterations, printing company, shoemaker, and a 50 person conference room. Our large, open team space fits 10 people, and a bilingual staff can speak French and Spanish. A FedEx Office Print & Ship Center is on-site, and a CVS Pharmacy is in the building. The Pedway underground walkway is one block away and the Chicago Theater is five blocks away.